They’ve reclaimed their throne, and now they need to prove they deserve it at MSI. Throughout the history of League of Legends’ biggest international events, only a couple of teams from minor regions have managed to stand out and succeed alongside, or sometimes even more so, than some of the major regions. GIGABYTE Marines from Vietnam stunned top dogs at both MSI and Worlds last year with bizarre off-meta picks. Albus NoX Luna from Russia went on a miracle tear through the Group Stage at Worlds in 2016 to qualify for the quarterfinals. The most Brazil has ever had to offer on the international stage, however, was KaBuM! e-Sports taking a single win from Alliance at Worlds in 2014, which sealed Alliance’s fate and ruined their chances of qualifying for knockouts. 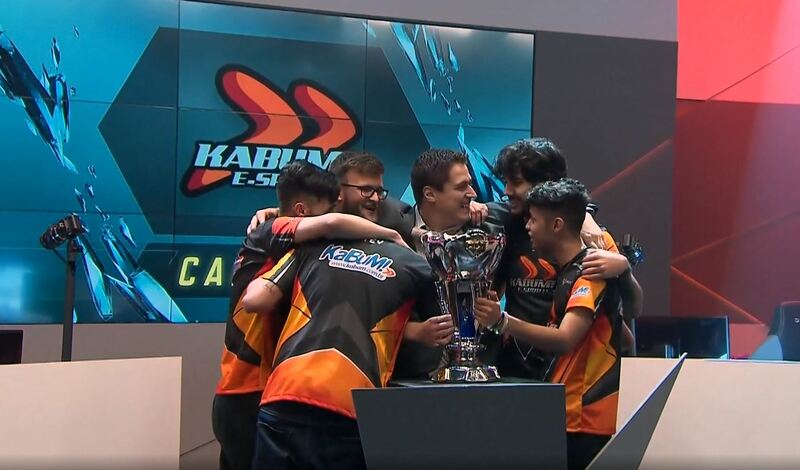 KaBuM is back on the international stage at the 2018 Mid-Season Invitational. They’re here to prove that Brazil still has a mark to leave, and that they still have more to offer than one win in the Group Stage. They have a chance to redeem themselves, but they’re once again the underdogs. When Brazilian fans look back on their region’s success on the big stage, they may always recall that time KaBuM stole a game away from Alliance—but it’s been a long time since they’ve been anywhere near the top. After their 2014 Worlds appearance, KaBuM fell hard from grace. They’ve bounced somewhere between seventh and fourth place for CBLoL splits over the past four years, and they made several appearances in promotion tournaments at the bottom of the barrel. They even lost a promotion series against ProGaming Esports last year. At the end of the last split, they were finally able to regain their footing as one of the best teams in Brazil by overthrowing Vivo Keyd in the finals, which also earned their spot here at MSI. They’re back in front of a European crowd that may remember them and despise them for hamstringing Alliance so many years ago. In other words, this comeback is four years in the making, and there’s significant pressure on them to not drop the ball. Although KaBuM has some hype on their side, their group is undoubtedly the more difficult of the play-in stage groups. They’ll have to beat Turkey’s BAUSuperMassive eSports, who are favorites to clear the Play-in Stage and tango with the big dogs in groups, as well as Dire Wolves. Dire Wolves have been a top team in the OPL since their inception in 2014, and they’ve won the last three splits in a row, making this their third straight international event for Oceania. The competition is fierce, and KaBuM will have to step above all of them to lock in their redemption run in the Group Stage. Their best hope as a team lies in the hands of ADC Alexandre “TitaN” Lima dos Santos, the very young superstar that burst onto the scene as part of a temporary lineup for Ilha da Macacada Gaming in 2016. He’s regarded by some as the best player in the region, and after earning MVP for two separate rounds for the CBLoL finals, he’s starting MSI on a hot streak. He shows extreme confidence on some of the game’s more aggressive marksmen, especially Tristana, Kalista, and Caitlyn. Unfortunately, Tristana became weaker in the meta at the end of the spring, leaving only Kalista and Caitlyn as his number one champions. That could make him a bit easier to target-ban, but he’s also proven that he can perform on more passive champions like Ezreal, too—he just isn’t quite as well-versed in that arena. Most of the roster is either young or inexperienced, just like TitaN, with one exception in Luccas “Zantins” Martins Zanqueta Silva, who’s been playing professional League since 2014. Typically, lack of experience is enough to cripple teams under this sort of pressure, but they stumbled for almost four years straight with an experienced roster. It took this roster with untapped potential, aggression, and almost a naivety that only a group of younger players could pull off to reclaim the throne. KaBuM might need this young roster to find a miracle at MSI, too. Keep an eye on KaBuM during play-ins on May 4 at 6am CT (1pm CEST) and May 6 starting at 4am CT (11am CEST).